The upcoming elections are far from free and fair. They are being managed openly, and the results have been decided already. These views were expressed by Gazain Marri, son of legendary Baloch politician Nawab Khair Bakhsh Marri, popular for his Marxist leanings, in a telephonic interview with Daily Times from a house in Kohlu where he claims to be ‘held illegally’. Gazain is contesting the national assembly election from NA 259 Sibbi against Balochistan Awami Party (BAP) candidate Dostain Domki. He is also contesting on a provincial assembly seat in Kohlu, PB 9, where his major rival is his brother Changez Marri. Gazain Marri, who claims to be under house arrest since July 13, told this correspondent that the entire machinery of the state, including security personnel, was busy in manipulating the electoral process in Balochistan. Marri said that a few days before his detention he was contacted by a civil bureaucrat who told him that a senior security officer wanted to see him in Quetta. Marri travelled to Quetta from Sibbi the same night. On arrival at the residence of the senior officer in Quetta, he was told that he doesn’t have an appointment fixed for that day and that he should wait for a call from a ‘private number’ for the purpose. Marri waited for three days, but didn’t receive any response. Subsequently, he headed back to Sibbi where he was detained. After two days, he was allowed to leave Sibbi. Instead of heading back straight to Quetta, he took a longer, infrequent route to visit his provincial constituency in Kohlu on his way. At Kohlu, he lodged in the house of one of his ‘influential supporters’. Within hours, he and his host were detained in the house, where they are being kept separately since July 13. Marri said he was not being allowed to meet anyone, even visitors from his immediate family. He says that when his son came to see him he was also detained, and was being kept in isolation. Separately speaking to Daily Times, Gazain Marri’s wife Shehrazad Marri said she had sent provisions and food items to Kohlu for her husband and son, but the vehicles carrying those were stopped on the way, and were not allowed to get to the house where Marri was detained. Ms. Shehrazad said she had gone from pillar to post in Quetta but no one was listening to her pleas. She wrote a letter to the Election Commission of Pakistan (ECP) but to no avail. Then, she filed a constitutional petition in the Balochistan High Court, which ordered immediate release of Marri. Responding to the high court directives, the Home Department of Balochistan wrote to the Deputy Commissioner of Sibi, asking for Marri’s immediate release (a copy of the letter is available with Daily Times). However, no action has yet been taken. Ms. Shahrazad has filed another petition in the high court that has been set for hearing on Wednesday (today). The deputy commissioner, who is also the DRO of the Kohlu constituency, has been summoned to explain the circumstances of Marri’s detention. 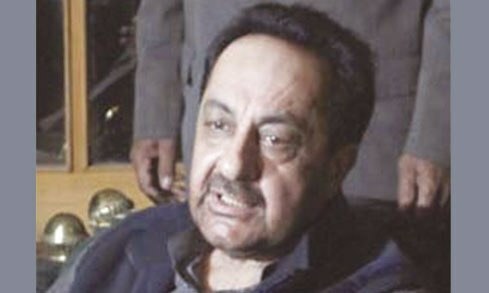 Marri said that the authorities were allegedly supporting his brother Changez Marri. “He is their blue-eyed boy and ‘laadla’ in Balochistan. I have still not been accepted as a patriotic politician, despite what I have gone through”, he said. He alleged that his opponent on the NA seat was also getting support from the authorities. Gazain Marri had returned to Pakistan in September 2017 after spending more than a decade in self-imposed exile. Before coming to Pakistan, Marri gave an interview to Daily Times in which he said he wanted to return and face all cases against him. He was arrested upon arrival in Pakistan, but was granted bail in November last year. The major charges against him include attack on the Levies’ station in Kohlu; and assassination of Balochistan High Court’s Justice Nawaz Marri. In January 2018, he was acquitted from terrorism cases after he announced to have parted ways with the separatists.